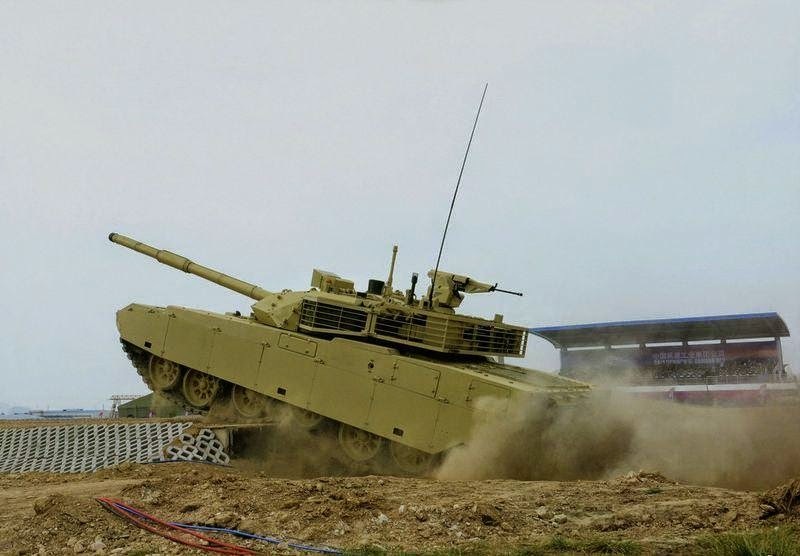 The Chinese MBT-3000 Main Battle Tank is the latest and most advanced export tank from Chinese Defense Company NORINCO. Offered for export under the designation VT4, Pakistan who are a prolific licensed manufacturer of Chinese tanks, was apparently trying to arrange trials for the tank in late 2014. First unveiled at the 2012 Eurosatory Defence exhibition in Paris, an improved version was relaunched in 2014 with some minor modifications and since then NORICO (Manufacturer) has been making public statements that the tank is superior to the new Russian Armata T-14 Main Battle Tank causing great online debates. On the 2014 version the following changes were made – 1. Remote Weapons Station added, 2. Smoke grenade Launchers moved back, 3. Covers on forward section of storage rack ((maybe hiding elements of the hard kill system) 4. 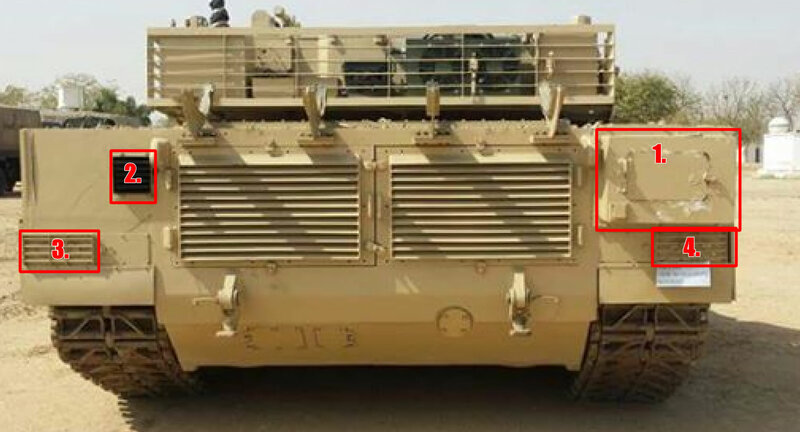 An extra covered block appeared between the commanders and gunners sights, which maybe part of the Active Protection System. On the rear the upgraded version will see that 1. a new box has appeared 2. The exhaust is now square, not round 3. and 4. The lights panels now have protective grills. 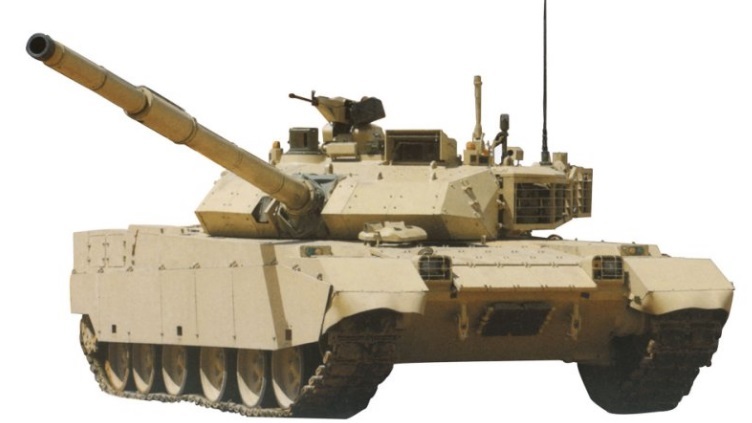 The vehicle has a full digitalised fire control system with a hunter killer capability making it a 3rd Generation Tank. The main gun is a ZPT98 series 125mm smoothbore capable of firing APFSDS, HEAT, HE shells and gun-launched missiles, with a maximum missile range of 5000m’s. The vehicle has a battlefield management system. As of 2014 it has a roof mounted Remote Weapon Station fitted with a 12.7mm MG, replacing the revious 12.7mm MG mounted on the commanders cupola. The vehicle alos has a 7.62mm coaxial MG. 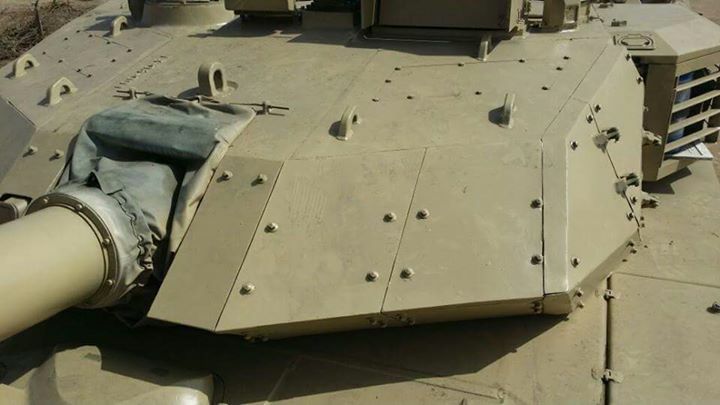 The frontal turret armour appears to match (wedge shape, inspection hatch on the top of each) that of the module armour used on the upgraded Type 96 and Type 99. It contains a modern composite armour (as used on the hull front) with Explosive reactive Armour built into it. ERA bricks are also mounted across the front of the hull. It also has an internal fire suppression system and electrical gun stabilization system, so as to reduce the number of parts that can “cook off” if the armour is defeated. Under the improved version of the vehicle, NORICO (manufacturer) has said the side skirts are now made of a composite armor (they probably mean it’s a ceramic or hardened steel) and ERA can be added to this. This would bring the vehicle up to a 4th generation standard, but has not been photographed with this added side ERA. It also has an active protection system that links laser threat warning sensors in to the smoke grenade launchers designated the GL5. The crew have full NBC protection. The vehicle has a 1300hp turbo charged diesel, automatic gearbox and torsion bar suspension. The driver even has a rear camera and monitor fitted for whilst driving in reverse. It has a combat weight of 48 tonnes (VT-4 42 tonnes) and is fully air-conditioned.